It’s impossible not to be filled with wonder upon beholding Carl Blum’s John’s Island train room. More than 1,000 feet of track wind through an idyllic landscape featuring three towns, a towering mountain range, wall murals, and bridges and tunnels galore. Blum, a retired Bosch engineer, didn’t just wing this intricate design: he laid it out on a drafting computer, incorporating 45 “turnouts” (where trains switch routes) and elevation changes of 28 inches. Operated by CAB controls, the trains chug through a 24- by 24-foot outbuilding that—thanks to the ”Toy Train Trust” in Blum’s will—is guaranteed to live on as a museum after his death. “One thing that’s seldom preserved are the layouts themselves,” explains the dedicated creative. CM: When did you start collecting? CB: In 1994, I was looking for a hobby and remembered how fun Lionel trains were as a kid. Like many new collectors, I first bought anything that caught my eye, but then I learned about model train operations. What impressed me was that each train had an origin and a destination like a real railroad, and that created a sense of purpose. So I built a layout for operations. It was 10 years before I considered it finished. CM: Why do you love this hobby? CB: As a kid, it really honed a lot of manufacturing skills. I learned how to cut things, and I liked to build electrical wiring. Now there’s artistry involved in creating the scenery, and I get a kick out of the innovative stuff like making my own turnout motors. I’m currently working on creating a motor that can be 3-D printed. CM: So did you create a lot of the display yourself? CB: If I can build it, I will. For example, I created the scenery using foam rubber from carpeting and mattresses (I lead workshops on how to do that), and I built one of the room’s best features: a 10-foot-long shelf with a gear drive for displaying nine levels of trains. I’ve done lots of smaller projects, like making a log bridge from a log I found on my property. CM: Where do you find your trains? CB: I bought a bunch of stuff while traveling in Europe, as well as in US antiques stores and flea markets. I now have 50 engines and several hundred passenger and freight cars, so I really only make a purchase if I find something very unique at a train show. CM: How often do you operate them? CB: Twice a week, several other operators and I get together; we have three layouts among us, so we rotate around. Each train has an ”assignment book” that instructs the operator to, say, drop off two boxcars in Jamestown, then pick up a gondola of pipe to take to Ruth’s Mountain. The challenge is to complete these tasks, shuffling the cars around quickly before the next train comes through. When Carl Blum was a boy, his Aunt Ruth made sure he unwrapped a train every Christmas. Today, the John’s Island retiree honors her with “Ruth’s Mountain”—one of three towns in his 912-square-foot model-train layout. Each December, this holiday-themed engine hits the tracks. Works: He retired in 2009 as a design engineer at Bosch. 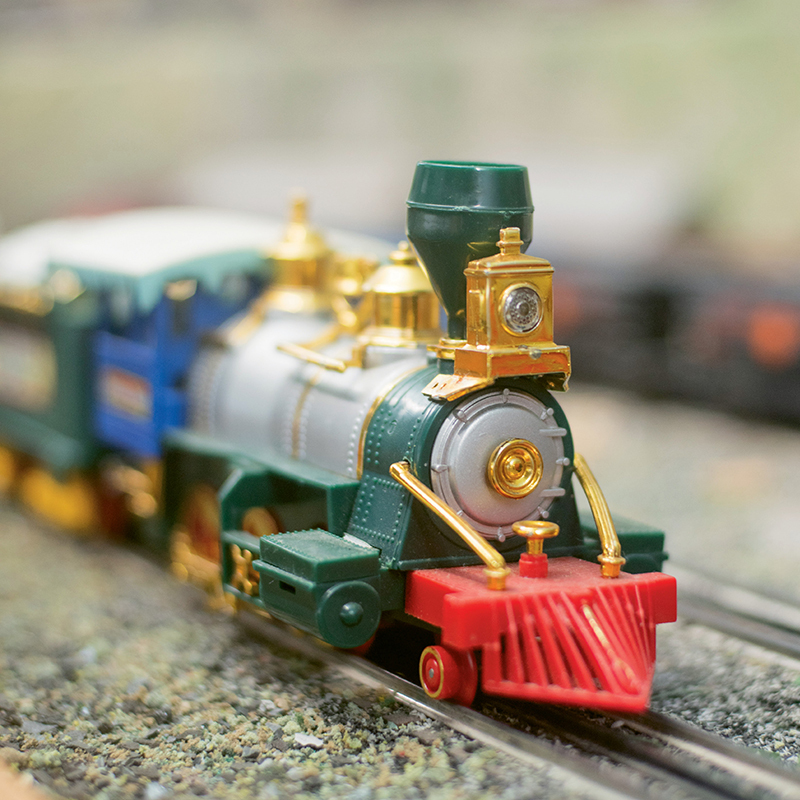 Local legacy: In 1998, he helped establish the Charleston Train Show, which the Charleston Area Model Railroad Club now hosts each November. Outside the train room: Find him contra dancing with Charleston Folk at the Felix C. Davis Community Center in North Charleston.